A Foundation Diploma in Art and Design can offer students a liberating environment, freeing them from the constraints of the A-level curriculum, whilst allowing them to explore their own practice more thoroughly. 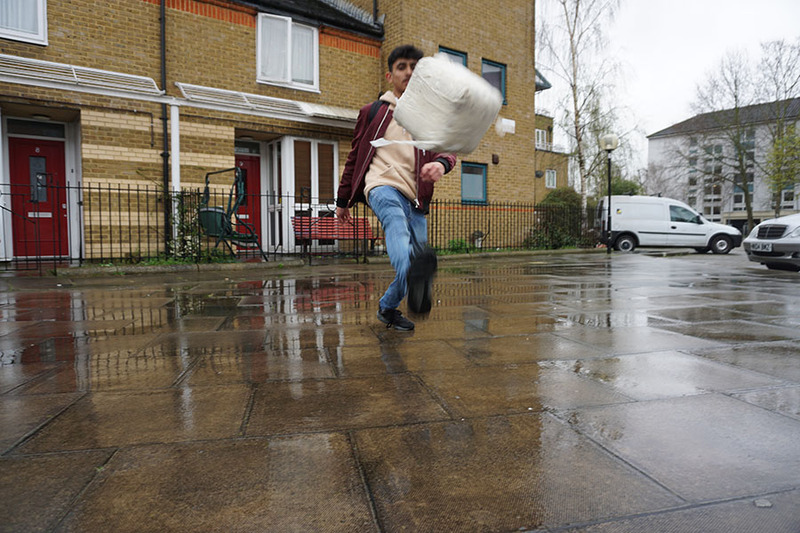 But for one Camberwell Foundation Diploma student, it meant more than liberating his artistic practice…it became about liberating and reclaiming London spaces too. In this blog we catch up with Charlie Waterhouse who reckons a year spent on Camberwell College of Arts’ Foundation Diploma in Art and Design has enabled him to communicate his ideas on sustainability and social awareness through his artistic practice. For Charlie that means making art that is both more inclusive and sustainable, whilst being humorous. Charlie had been encouraged to apply for the Foundation Diploma because of the flexibility of its course structure and because it gives students the time and space to explore what makes them tick artistically. Charlie could have elected for the diagnostic route – which exposes students to a wide range of disciplines but decided on the specialist option which is more suited to students who are confident about their future direction. Either way, the course helps students build a strong portfolio of work (a must-have when applying for most practice-based art degrees) and those all-important UCAS points when applying for other courses at undergraduate level. Tell us more about your experience of your Foundation Diploma year and the projects that came about because of it. I chose the sculpture specialism on my foundation and I make social sculptures. I would say my practice is very environmentally engaging, and quite dependent on my experiences and my surroundings and the way I respond to them. For one of my projects during the Foundation Diploma, I made a home out of a backpack by recreating a domestic space. I covered it with cardboard and filled it with a carpet, pillows, and warm lights. 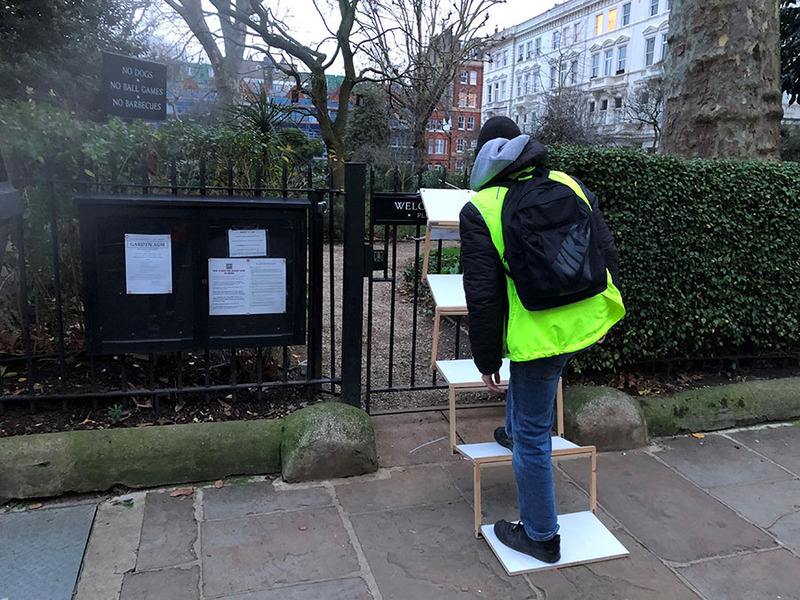 I also created a staircase that I used to re brand a private park as a public area but right now I’m working on my summer show project, looking at public signage to see how they can be used to reclaim space through re-wording them. I’m looking to host a No-ball World Cup at White City, in response to a ‘No Ball Games’ sign which has appeared outside a recently redeveloped shopping centre. So why the interest in reclaiming spaces? 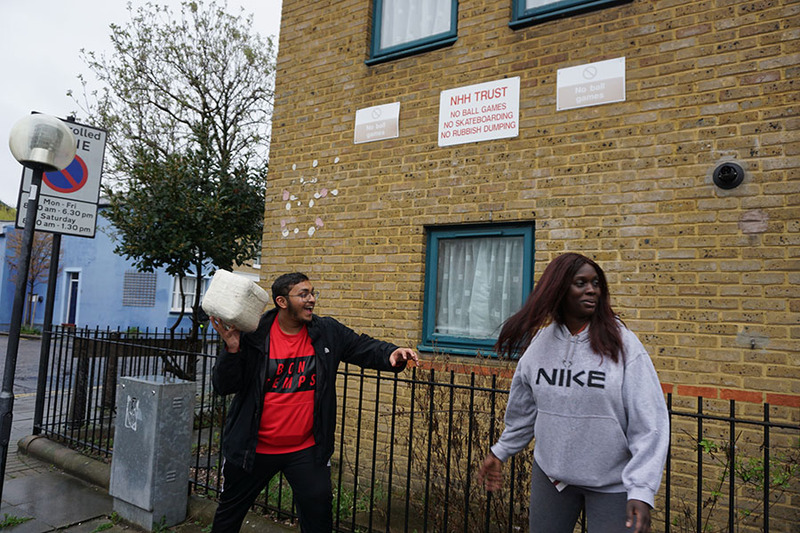 My interests in reclaiming spaces began when I was growing up in west London trying to find free spaces to meet with my friends in central London. 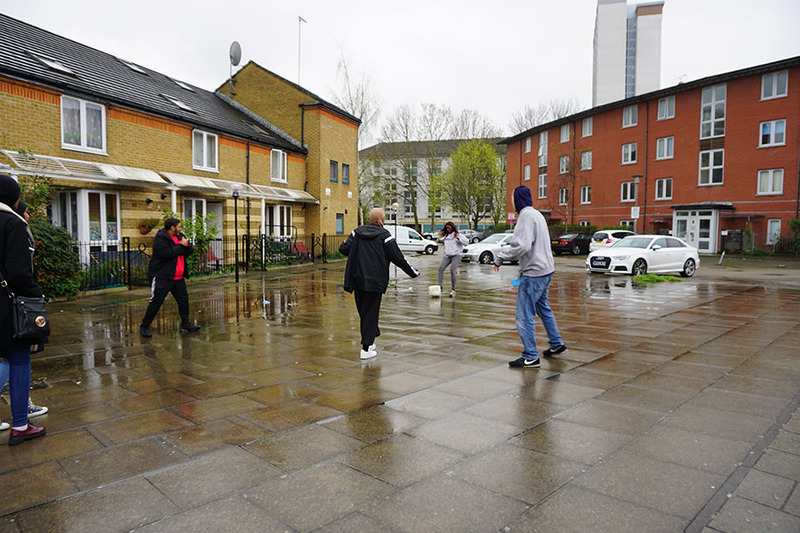 We would walk around for ages looking for spaces to hang out, but it was difficult to find free, unrestricted space. I realised that there were spikes everywhere and you couldn’t sit down in many places because buildings and companies designed these spaces to be unwelcoming. I was uneasy about it, and I responded by creating a rucksack mattress that could be turned into a chair-mattress or wind -break. All of the materials used for this project were recycled from things I found on the streets, I found a tarpaulin, foam and polystyrene and used this elements to form the piece. During my foundation I have been involved in the Re-use Exchange project which enabled us swap materials and re-use materials in projects. I like to talk a lot about sustainability in my work, especially how essential it is that that small businesses have a space that won’t be taken over by a corporation. One of the things I consider to be very important in my work is humour and how you can communicate with some important political or social issues without being overwhelmed by it. If I’m going to be political I need to be humorous in order for it to be refreshing and to be heard. And for the Foundation Diploma summer show…what have you got planned? For my final major project I want to ‘share solutions’ and I’m currently looking at the environment around the BBC building in White City. Outside the building there are all these new shops that have just popped up as well as lots of ‘No Ball Games’ signs outside. That area used to be a place where people would meet up and play sports like ping-pong and now there are only chain shops and big gyms, which is kind of weird. I want to reclaim the environment back by changing the wording of the signs. For this project I decided to make something that functions as a ball, but being square is not technically a ball. Its constructed out of kitchen sponges, tape and the skin of an old football and can be kicked just like a ball…but of course isn’t one. I’m basically twisting words to take back the space. I will host the No-ball World Cup in that space with seven participants per team and the final piece will be the performance, which I will record via video and a series of photographs. For me the work that comes afterwards is mere documentation, I’m more interested in the participation of the project. I really like the book The Emancipated Spectator by Jack Ranciere, it’s definitely food for thought. Also, Tania Brugera’s social engagement practice and the way she’s engaged Cubans around the world has been inspirational. Has the Foundation Diploma influenced your view of art? Camberwell’s Foundation Diplomas has influenced me enormously and it has been extremely positive. Everyone’s been very friendly, from the students to the staff and tutors and it’s a great place to grow both your practice and as a person. It’s being quite fundamental to my development as an artist. There is a great sense of community and it feels really integrated. As well as Slade, I’m waiting to hear from Glasgow University to study Environmental Arts and I also have an offer to study Intermediate Art at Edinburgh. After that I would like to continue studying and exploring environmental art and see how I can adapt it, also socially engage art by bringing our communities into the discussion and to make art more inclusive to everyone. I want to bring art into everyday life. Charlie Waterhouse has also been volunteering for almost two years with the charity Solidarity Sports, working with vulnerable young people in West London. Charlie is part of their mentoring program, mentoring a twelve-year-old, who he takes take out every Sunday for walks, cinema and other activities. To see Charlie’s work visit the Foundation Diploma Summer Show 2018 from 7-11 May.